The not-for-profit organisation has an overlying ambition to reduce the number of men dying from prostate cancer by 25 per cent by 2030. To do this, it’s built out the annual Movember fundraising initiative, a moustache growing event that more than 5 million ‘Mo bros and Mo sistas’ have now actively supported. These efforts have seen Movember fund 1200 projects to improve men’s health and access to care and raise $938 million to date. In 2018, the goal was to increase annual fundraising, which came in at US$67.5 million in 2017, by at least 15 per cent. To do this, the team looked to lift its mobile messaging game, bringing on real-time mobile engagement technology vendor, Swrve, to help achieve these ambitions. Movember business analyst and integration lead, Jeff Guthrie, told CMO the charity organisation previously used Localytics for push notifications globally, largely as an adhoc activity. This meant the system was not connected through to other Movember customer management platforms, making it difficult to gain consistency, scalability or tailor member engagement. The organisation’s move to Oracle Eloqua marketing automation last year prompted the team to investigate complementary mobile marketing technology options from Oracle’s partner ecosystem, leading to the choice of Swrve in May. Integrated started in July and was a straightforward process, as Swrve’s platform offers pre-built connectors into Eloqua. Things were set up to go live before Movember’s busiest time of the year: Q4. Implementation was a matter of installing the pre-built app into Eloqua and adding in account details, such as whether a user has the app, their OS version and device, then hooking those fields up on the Swrve side to push through data. The Swrve software development kit was then installed into Movember app with the help of the group’s mobile app agency partner. Testing was undertaken to ensure data flowed back and forth between systems, as well as to learn about the platform and what it can do. Most of the work was undertaken by a Swrve team in the west coast of the US, and Australian staff liaised largely via Slack on ideas for what activities to run and the implementation process. “They were incredible to work with and help us out with ideas on what campaigns to run. We’re fairly new to push, and they had a lot of experience and know what works and what doesn’t,” Guthrie said. Because of the native connection between Swrve and Eloqua, the push campaigning fit into existing customer journeys, and messaging is consistent and complementary to email communications also being run. Personalisation criteria used includes country, gender, and participation type, such as whether participants are growing a moustache or committing to Move by walking or running 60kms over the course of a month. Additionally, criteria took into account whether people had opened certain EDMs, had interacted with in-app features, such as the camera, or had logged a Move. 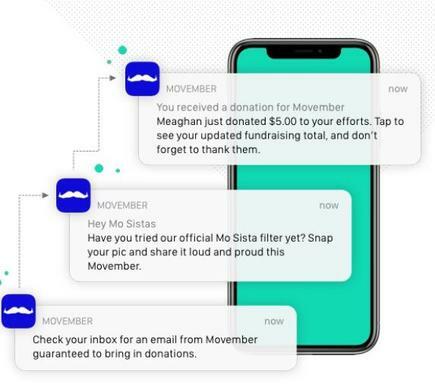 In addition, it was the first time Movember has been able to send transactional push notifications letting fundraisers know in real-time when someone had made a donation to their cause. Push notifications were also used to highlight new app features, and a custom on-boarding experience was provided to new members. The results speak for themselves. Efforts have led to a triple lift in engagement across Android users globally, with more than 90,000 promotional push notifications opened across Android and OS smartphones. This is well above 20 per cent of its participant base, and 57,000 app users opted in to push messaging in the first three months. Movember also saw a 48 per cent increase in email revenue as a result of the multi-channel approach to messaging, with opens increasing 9 per cent. Another notable stat is the rise in in-app camera-related sessions, by more than 23,000, a further sign of engagement. “We saw fantastic results using the Eloqua integration, enabling us to combine push notifications into our existing supporter journey and include both iOS and Android app users,” said Movember digital marketing and automation director, Meaghan Bilinski, adding the group saw higher push notification engagement rates than ever before globally. Locally, 17,500 iOS users in Australia generated more than 688,000 sessions, while more than 10,000 Android users had 355,000 sessions. This compared to global results of 53,000 users and 1.8 million sessions (iOS) and 32,000 users and 971,000 sessions (Android). Despite knowing more and more members are asking for interaction via their mobile phone, one surprise for Guthrie was how many people liked getting push donation notifications. “We put in opt-in via push via app and had good response. People loved it when they received a donation as opposed to email and have asked for more,” he said. As a result, the team is now looking at push notifications for when someone joins a Movember team, post-donation information, and if there’s an event in the individual’s local area.